Two of America's premier singer-songwriters joined forces for an acoustic evening backed by nothing but their superb voices, first-rate guitar playing and charming reminiscences in Sisters Starry Nights 40th live music show Tuesday, January 29, in Sisters High School (SHS)Auditorium. Starry Nights is a fundraiser for the Sisters Schools Foundation and has raised more than $1.3 million since its inception in 1997. The event is run by volunteers including Jeri Fouts, Susan Arends and Novella Swisher. The event raises funds for both curricular and co-curricular programs for Sisters elementary, middle and high schools. Swisher said, "In 1996 when my husband, Steve, became superintendent of Sisters schools, discussions revolving around fundraising for the schools was one of the first topics addressed." Steve Swisher founded the Sisters Schools Foundation to gather fundraising efforts under one umbrella, and Fouts conceived the idea of a concert series to benefit the foundation. Swisher added, "I partnered with Jeri and Susan utilizing my organizational skills to support the endeavor. We each bring a different aspect to our partnership, and this successful combination of our three skill sets has served our cause well for 22 years." Concerts are now scheduled as the opportunity arises, and this year's show was the first after a three-year hiatus. The evening raised $75,000, exceeding the organizers' goal. Fouts noted, "Lyle and John had both expressed an interest in returning to Sisters. We've been working on this concept for some time and this was the year it all came together based on their schedules. They were graciously willing to donate their time and kick off their 2019 tour together in Sisters with Starry Nights." Right before the show, like a premier pre-concert party, guests enjoyed delectable hors d'oeuvres prepared by students of the Sisters High School Culinary Arts program, under the guidance of their teacher, T.R. McCrystal. Guests mingled among friends, checked out the silent auction and listened to a variety of musical performances by the Americana Project, Jazz Band and Jazz Choir led by music teacher Rick Johnson. "This is our first time here, and I like the setting where two very accomplished musicians sit down and chat with each other in between songs," Sisters resident Jeannie Ogden said. "I think it's an ideal way to learn about them and how they think." Sharlene Weed, executive director for Sisters Habitat for Humanity, added, "I'm just excited that those two incredible musicians are here in our small town. Plus, I love supporting Sisters schools, so it's a win-win situation for me." SHS students Roy Gannon and Bennett Lewis, this years masters of ceremonies, opened the show welcoming the audience before Lovett and Hiatt took the stage. The show was a charming combination of acoustic versions of Lovett's and Hiatt's songs intermingled with witty storytelling. Each musician watched appreciatively as the other played, occasionally collaborating on a song together. No flash, no glitz, just two guys and their guitars. The performance included some of their most beloved songs. 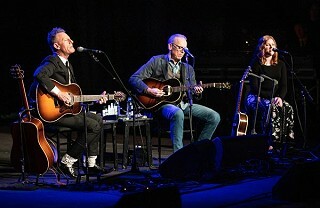 Near the conclusion of the show, after Hiatt crooned "Have a Little Faith in Me," one of his hit songs released in 1987, Lovett asked choir director Johnson to come out on stage. Johnson introduced True Duerden, an outstanding singer in Sisters School District, who was chosen to sing "Closing Time" with Lovett after auditioning with 10 other talented music students. "As a member of the Starry Nights Committee, I worked with Jeri Fouts to find the perfect student performer for the concert," Johnson said. "A week before the concert, SHS music teachers Julie Cash, Tyler Cranor, and myself auditioned students for the opportunity to sing with Lyle and John. All the students did a great job, and it was difficult to choose. However, True Duerden took the audition one step further than anyone else. She sang harmonies on the chorus of the song, as well as on some of the verses." Growing up, Duerden had a passion for the arts inspired by her family. "I have channeled this passion into my singing, dance, and visual arts. To have had the opportunity to sing with such esteemed performers as Lyle Lovett and John Hiatt on Tuesday marked a point in my singing career that I will never forget," she said. "I am especially grateful for this experience as I plan on continuing to study music in college. I was amazed by the inspiration and perspiration it took to make it all possible, and I thank all of those who help to put on Starry Nights, they truly make a difference in our community." Duerden gives a shout-out to a few special teachers in Sisters community who have trained and mentored her, making her journey extraordinary: Rick Johnson, Tyler Cranor, Lonnie Liddell, Jeanne Wentworth, Rebecca French and Bethany Gunnarson. Swisher added, "We are thrilled to have had these two artists together here as the first stop on their current tour. Their earlier appearances as individual performers were so well received by our supporters that our ticket sales for this duo was nothing short of amazing, selling out in under 10 minutes! We are grateful for our sponsors and patrons that have continued their generous support of Starry Nights from our humble beginnings 22 years ago."